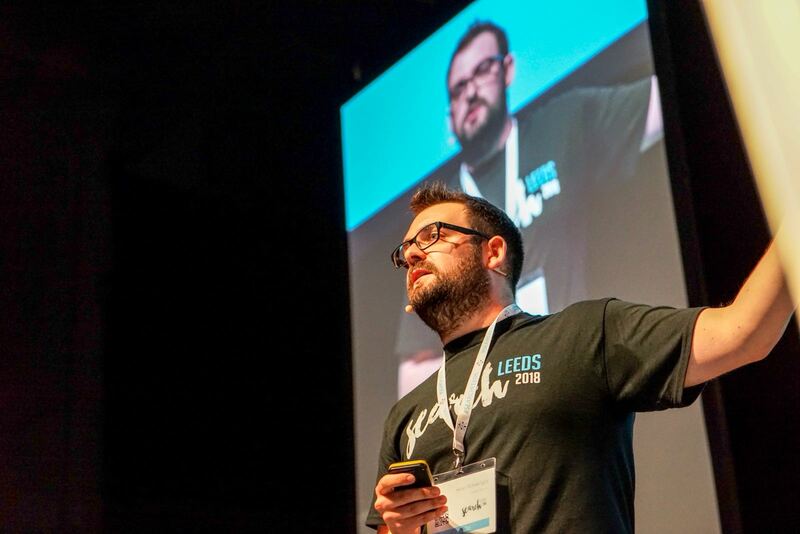 We learned so much at SearchLeeds that we split our recap into two parts! Part two is focused on technical SEO and covers anything from keywords, to site speed, to website audits, migrations and more. 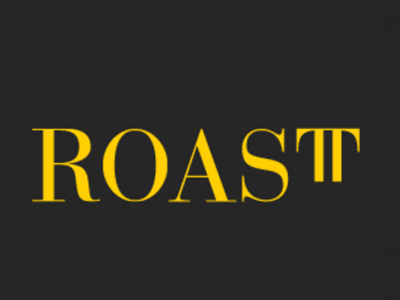 If you haven’t read part 1 of our recap, you can find that here. 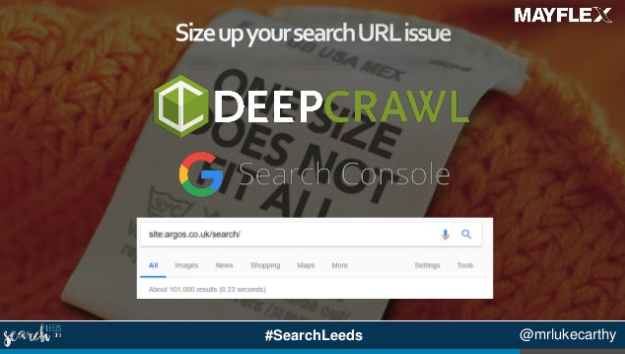 DeepCrawl CAB and founder of award-winning performance marketing agency Peak Ace AG Bastian, kicked things off on the SEO track at SearchLeeds to share his knowledge on how to make websites faster. For Bas, performance should be about user experience. As fast loading times play an important role in overall user experience and at their core, should be about making people happy. 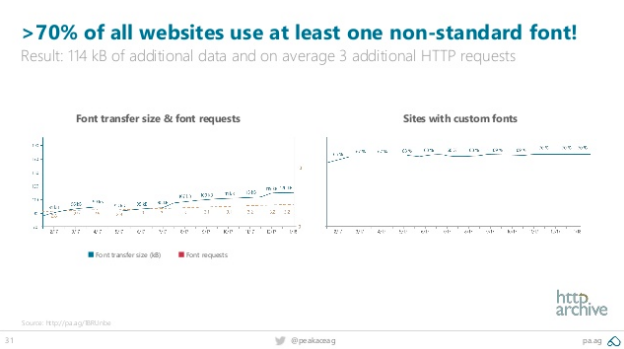 Which is why it’s no surprise that slow loading pages are a major factor in page abandonment. 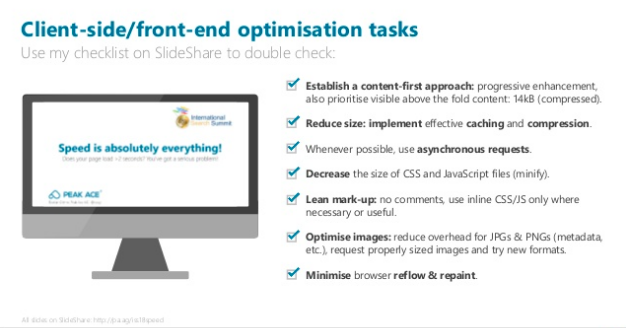 There are plenty of client side and front end optimisation tasks as well as server side and back end optimisation tasks you and your team can try today, to make sure you’re getting the basics right. By now, many of us have migrated our websites over to the more secure protocol that is HTTPS, which means we have more site speed options available to us. Namely, moving to HTTP/2! If you don’t want your website to have pages that look like the example above, you can use DeepCrawl to check if you have any HTTP pages which will trigger a warning in your user’s Chrome browser. A great way to start doing basic optimisation for images, is to use tools like tiny JPG or tiny PNG as seen below. These give you a super easy way to put those images on diet, without compromising on quality! Another way you can save loads of MB in images, like 1.74MB out of 1.9MB, is by using a tool called Cloudinary. It makes for better image or video compression, combined with modern image formats, such as WebP, FLIF, BPG, and JPEG-XR. For help finding the CDN that suits you best depending on where you are and which regions/countries you’re mainly serving to, check out CDNPerform. You should also test the latency of your CDN or server from all over the world. A majority of websites use a custom font, and this leads to extra baggage that slows things down. Often times, we pick the easy option of using external CSS, but don’t realise that that is causes render-blocking. Both FOIT or flash of invisible text and FOUT or flash of unstyled text can cause annoying flickering, which annoys users. If you’re dealing with customised text you need to make sure it is the least annoying as possible. You can fight FOUT content by using a font style matcher, or try using a font display strategy. Bas recommends checking out Monica Dinculescu’s SmashingConf talk called Fontastic Web Performance for blocking and swapping, as one line of code can make all the difference. If you only do one thing, go to your CSS file, look for @font-face and add ‘font-display:optional’ as this is the safest and easiest website performance gain! Google Webmaster Trends Analyst John Mueller clearly advised against asynchronously loading content as it will delay processing and indexing, in this Google Webmaster Hangout last month, which you may have seen me share on twitter. Don’t be lazy; asynchronously loading #content and links will delay processing & #indexing. Don’t be lazy and rely on one metric to cover your bases, the page speed insights score is not enough. There are ways of tracking performance by comparing the received speed before and after. 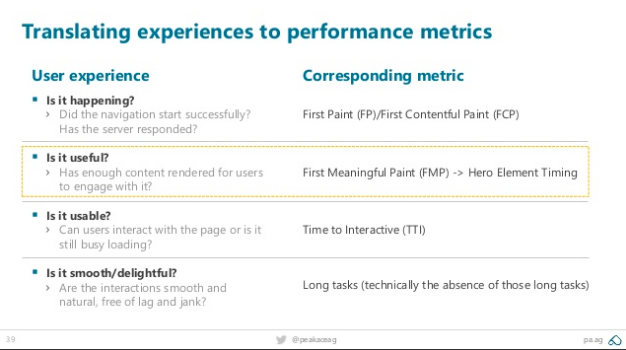 One of the examples above ‘time to meaningful first paint’ makes a huge difference to user experience in terms of speed perception. To optimise these you can jump into Chrome Dev Tools>performance>profiling to check out ‘Frames’ for the different paint times. 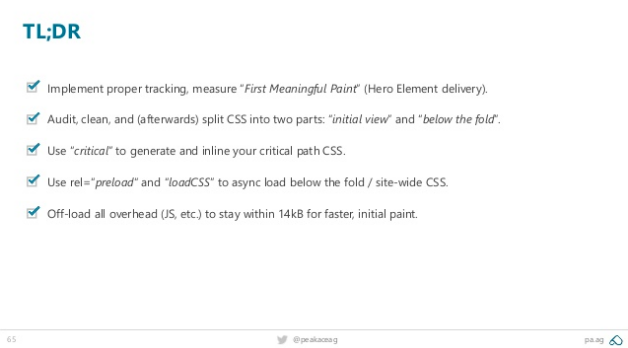 As well track paint timing with Google Analytics (in theory) to make sure your PerformanceObserver is registered in the head before any stylesheets, so it runs before FP/FCP happens. Oh, and make sure your homepage is fast! If you’re curious about how the cool kids are doing this, try using Google Tag Manager, which you can also combine with Google Data Studio, and unify paint time in a way that’s fun to use. Google just introduced ‘first input delay’ (FID), which measures frozen phone states, or the time from when a user first interacts with your site to the time when the browser is actually able to respond to that interaction. When you have CSS/JS that’s slow, FID will show you how the CPU is going. This covers the code and resources required to render the initial view of a web page, for everyone that’s accessing your site from different devices. But first, Bas gave us a bit of technical SEO/website development background into what this involves. Google doesn’t make a single GET request for CSS files. Inlining the CSS is faster than having a single CSS file for each, and requesting external CSS is more expensive. That said you could approach it differently; by splitting up the CSS that’s required for the initial view, then having CSS for the rest of the site and using ‘critical’ renders in multiple resolutions and build a combined version. One for first view and one for rest, which works on every device, is bullet proof and the fastest way! For some, AMP drives discussion, innovation and enables collaboration as it becomes an agenda topic across stakeholders. BUT let’s face it, it also creates loads of extra work! As it involves creating new CSS/extending CMS’s and their capabilities, which increases IT and maintenance costs. Plus, the average user doesn’t really get what’s happening, and it’s not really open source (even though it’s on GITHUB). Google is very much in control on this one, and AMP isn’t really that fast! The Guardian’s regular responsive site is faster than with AMP, as Google is preloading pre rendered material – which feels faster. If you have to use AMP, for example if you’re a publisher because you want to be on the carousel, that’s fine. Just don’t put AMP on a slow site. If you’re looking for predictions on what has the most likelihood of being clicked to preload/pre render that, give Guess.js a go. In this session Gerry, SEO Consultant for Just-Eat and co-founder of SEO Roundtable event series Take it Offline, walked us through the history of the mobile web through to where we are today in terms of the key technologies as well as ideas about the future. From early Nokia’s like the 7110 in 1999, to the rise of 3g and the iPhone. Unlike competitor devices, the original iPhone didn’t have GPS, but it did have the app store, which is what changed the game. Companies began optimising for apps, rather than optimising for users. This data visual by Tableau sums it up quite nicely. 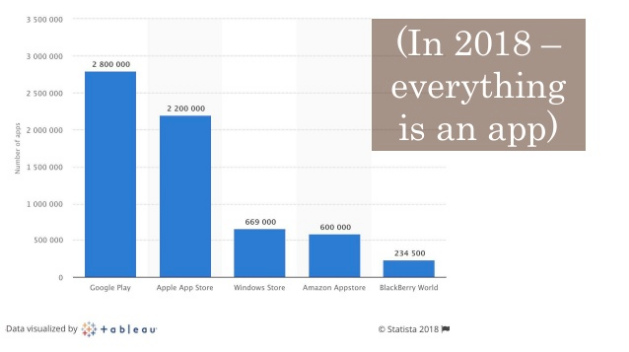 The down-side of this reality is that 60% of apps have never actually been installed. Like Bas, Gerry stressed the importance on shifting our mentalities towards UX. Case in point being to stop annoying people with interstitials. As marketers, a lot of us have stopped respecting users, as companies are pushing apps for everything…at the user’s expense. To optimise your PWA it’s worth referring to Google’s PWA checklist, and pay attention to ‘manifest JSON LD’ which is like an xml sitemap as it’s a small text file where you can choose how it looks as an app, and ‘service worker’, which intercepts how you as the website interact with the server, where you can choose what works offline. You can inspect this using Chrome Lighthouse, Google gives you the code for this and your devs can implement it. Hurrah, gone are the days of expensive app developers! In case you didn’t know, the level of stress caused by mobile phone delays is greater than a horror movie. Don’t believe it? Check out this study by Nichola Stott’s technical marketing agency Erudite. A new programming language that could help you with this is ‘web assembly’, which is nearly as fast as running native machine code. 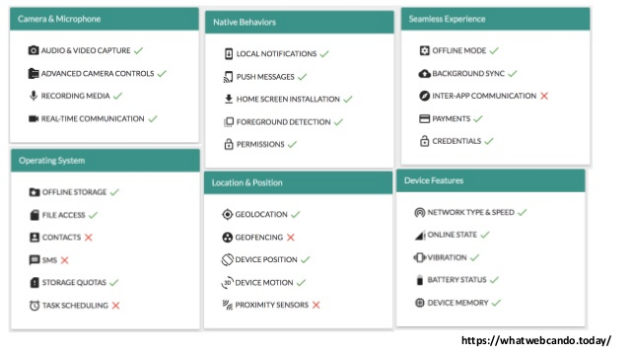 For best practices on entity-first indexing and mobile-first crawling, check out this awesome 5-part blog series explaining exactly that on Cindy Krum’s blog for Mobile Moxie. Did you know you can now order an Uber from within google maps? That is both great technology and great UX. As, even if you don’t have the uber app, you can still benefit from it! 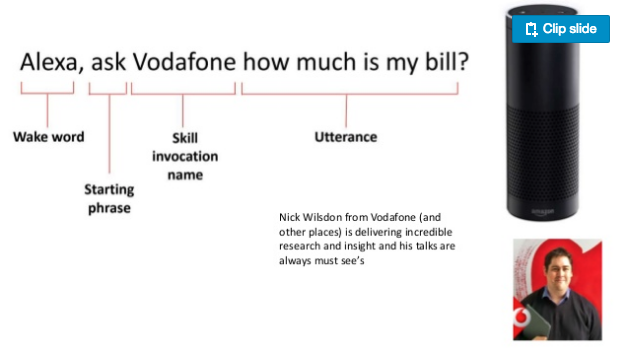 There are even more excellent examples of this in the research of DeepCrawl CAB Nick Wilsdon who is the Search Product Owner of Vodafone. Steve is an SEO Manager at the award-winning SEO and content agency Stickyeyes. He walked us through the do’s and don’ts of the migration game. And shared an example of the striking differences between doing this well, or not! It’s important to set responsibilities from the getgo, AKA who is doing what. This is also an opportunity for overcoming silos, as getting the UX, design, analytics, content and SEO teams onboard from the beginning points out how important each of these areas are to a successful migration. Moreover allowing you to ensure resources are available where necessary, for example ensuring that the one person needed for a major task is going to be away when that tasks is scheduled to to be done. And if they are, and you’re mapping 1,000s of URLS, make sure you have enough people to help who aren’t on holiday in this period! You should share your pre migration plan with key stakeholders, taking care to be clear and concise. 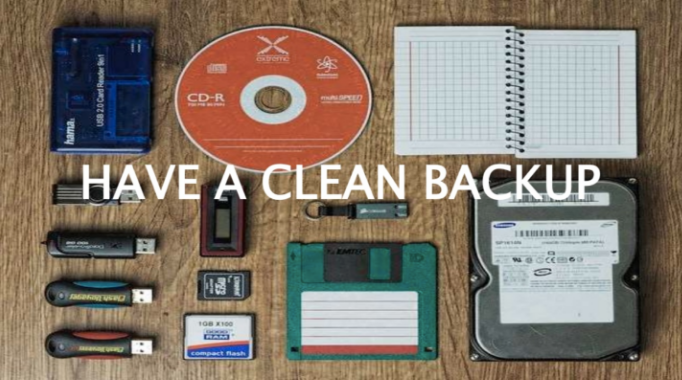 A good checklist is not to be snuffed at, it can really help make sure you don’t forget anything, such as having Google Search Console and Google Analytics checks. Protip 1, don’t do it on a friday, maybe migrate at a low traffic time like a Saturday at 4am! How deep do you want things to sit? How does one area flow with the greater makeup of the site? Being conscious of your IA is important, and an SEO needs to be involved in this process. For gathering URLs, you need to capture as many as possible in order to map out the new site structure well, for which Steve recommends using DeepCrawl. He also recommended checking your log files, using an analyser like Screaming Frog. Did you know you can upload your Screaming Frog log files into DeepCrawl for an added data later? This is a great way to see how or where your crawl budget is being used or misused! This is crucial to any migration to make sure URLs are mapped to their new counterparts correctly. An easy way to do this is by analysing your live and staging environments in the same view using DeepCrawl, to see what has been mapped where so far and see all of your legacy redirects in one place too. Make sure your target country is specific and that all HTTP HTTPS www variants are added, by crawling and evaluating the key checks such as finding broken links with unaccessible content, incorrect hreflang or canonicals, their status codes and more. Protip 2, double or triple check everything! Before you migrate, it’s worth your time to do a link profile review. For help on this, I’d recommend you take a look at the Crawl Centred Approach to Content Auditing by Sam Marsden on State of Digital. As well as checking your internal links, it’s also a good idea to assess your ranking benchmark for keywords by using a tool like SEOmonitor or Stat Search Analytics. All of which you can do with the tools below. 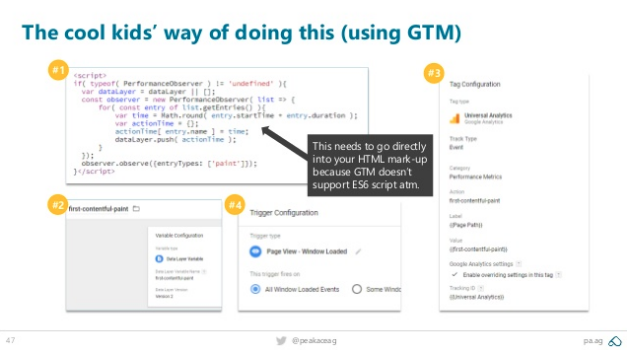 Steve also advises you use GSC and/or DeepCrawl for monitoring and testing, and fetching and rendering to make sure Google is seeing the site properly on both desktop and mobile. As well as looking at hreflang to see if it’s correct – especially given how often hreflang is messed up. If you’re working on international sites, it might be worth migrating one site at a time. Use GSC to make sure you’re not missing/blocking and scripts that are important which might affect the rendering of your page. 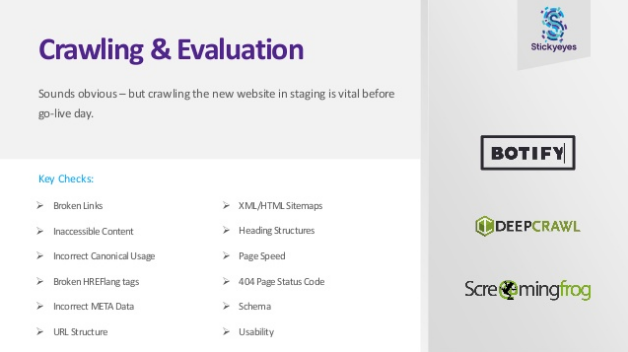 Try using the Page Speed Tool, Pingdom or GTmetrix to benchmark your new site against your old site, and make sure your site is mobile friendly, including making sure text is readable that clickable elements are set up correctly, and your structured data has been reviewed. Performance monitoring: competitive landscapes are useful, as is checking organic traffic over time, conversion rate and engagement metrics – hence having your UX team involved. Protip 4, celebrate success – migrations can take ages, reward yourself! Fili is an ex-Googler, co-founder of Search Brothers agency alongside Kaspar Szymanski, a DeepCrawl CAB and well known SEO expert. His session reviewed the impact of structured data on Google SERPs. Structured data helps with click through rate (CTR), which means it also helps drive more people to your site. It can also be used to reduce duplicate content, in other words telling the big G that the same specific data is related to products that are separate, giving Google better context about your site. Bing supports JSON-LD, and they even have a json validator new tool. But this is far from being ready, in fact it’s very buggy and only picks up the first 8 or so schemas it finds even if there are 200 on your page! 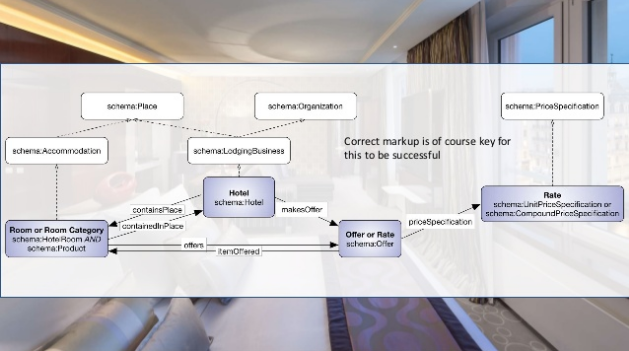 It’s worth having a look at pending schema.org, as the community takes recommendations for future schema, this is quite powerful. Have a unique sales proposition and add value to the user from a content perspective, don’t markup hidden content or misleading content. Google doesn’t like this, for example when a website has a review in the footer of a page which isn’t a true representation of the content. To avoid no no’s like this, it’s important to be aware of Google Webmaster Guidelines, like adding structured data and then block the pages you had marked up in your robots.txt. 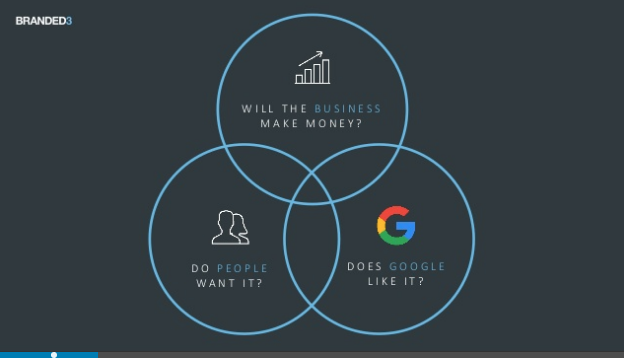 It sounds simple but people do it a lot, and if you do it – Google can’t see it! Do use JSONLint to check if your codebase is working.Avoid mismatches – as SEOs we need to check these things ourselves as well as using tools, including checking for mobile desktop parity. This will only be more and more important as we move towards the Mobile-first Index. Kristine is the founder of Sites Without Walls and a well known writer on the SEO circuit and speaker at events like SMX Advanced and SMX East. Which is why it came as a surprise to many folks in her audience that this was her first time speaking this side of the pond. And she smashed it! 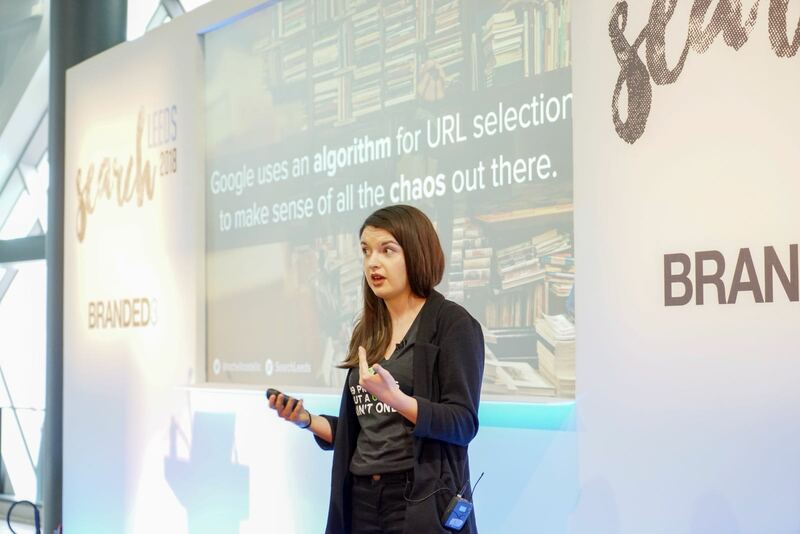 She gave us an overview of Natural Language Processing (NLP) algorithms, the Knowledge Graph (not the Knowledge Graphs us SEOs are busy optimising for), Google’s Wonder Wheel and more. Kristine walked us through the beginnings of Google and the paper their founders published on the anatomy of the web, before Google was even online. Fast forward to today and there is so much data out there! Did you know there are 63,000 searches per second? Google was founded on unstructured data, which is just text based data, this basically just involved keywords put in the title and keywords everywhere, gone are the days of black hat rankings, but as queries moved up into the trillions this kind of system quickly began to not make sense, and data needed to be structured. So Google moved from relational databases to Knowledge Graphs and we entered Semantic Search, which gives meaning to what is on your page. This helps the search engine try to derive meaning from your page and understand intent. Google shifted from a ‘bag of words’ approach to ‘things’, aka structured data – where things are known objects with known or learned relationships. The Wonder Wheel helped see how things are connected. It’s worth distinguishing that Knowledge Graphs are based on known relationships and THE Knowledge Graph is Google’s database. The latter enables you to search for things, people or places that Google knows about, like landmarks, celebrities, cities, sports teams etc. Basically NOUNS, nouns=entities. Google is moving towards Entity Search and from there NLP, using the developer API for entities to look up what can be entered in the Knowledge Graph. Answers from the Knowledge Graph are things like direct answers, featured snippets, rich lists etc. Hummingbird helped string to things and is faster/better at search, as it added semantic layer of meaning and understanding to search. For example knowing that things placed next to each other probably meant something, like having ice and t next to each other most likely signifies Ice T.
But, as Google doesn’t do NLP or process information like we talk, they need an interpreter which is structured data and schema. Page markup allows engines to better understand what a page is about. JSON LD is the recommended sham code; one of its benefits is it can be removed from the HTML structure so its easier to write, implement and maintain, plus it sits inside your page as opposed to your html. For best practices on this, use Google’s guides and schema.org to find everything that is supported. Google makes it simple to understand what they support, as well as what causes manual actions, such as when JSON/what’s on your WordPress page doesn’t match as Google sees this as cloaking. For unknown queries nowadays, we have Rank Brain which is useful when entities meanings are unknown. Dawn is the Managing Director of Move it Marketing, an Associate Lecturer on Digital Marketing and Marketing Analytics at MMU and a DeepCrawl CAB. Her session focused on the evolution of information retrieval and the rise of mobile search. Takin it to the (search) meta! Dawn walked us through relational theory, the many layers to the mindset of the searchers, and how that relates to what Google is trying to achieve with its algorithms. 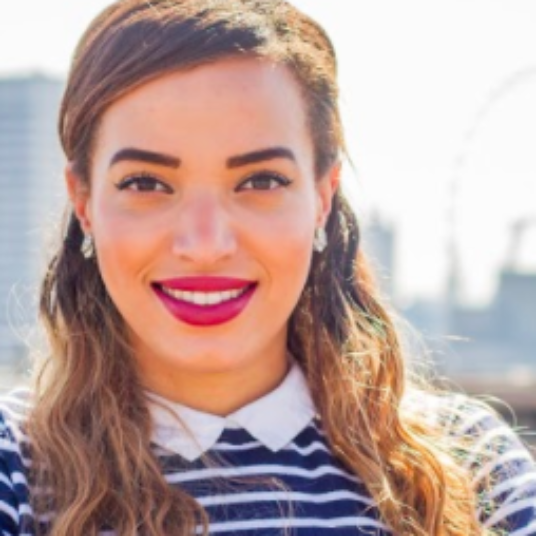 She introduced many of us to Mizzaros Framework for Relevance, which relates to user problems, time, and components and its relationship to SEO. She also outlined Matt Cutt’s work in the area of information retrieval as well as Andrei Broder’s. He contributed a lot like Matt, but didn’t speak to SEOs directly. He made his mark with ‘assistive AI’. 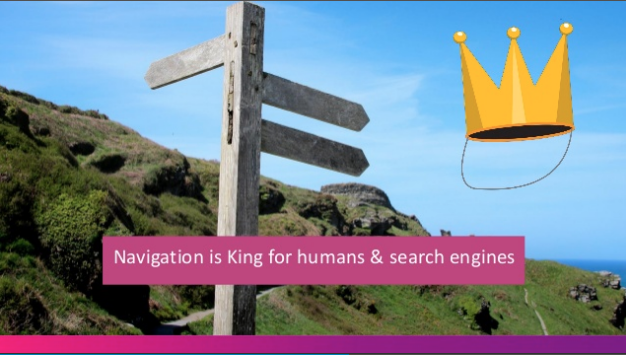 If you’ve ever come across the terms ‘Informational’ ‘transactional’ and ‘navigational’ in relation to Search, these are the names of the types of queries people use, and were created by Andrei. Interested in learning more? 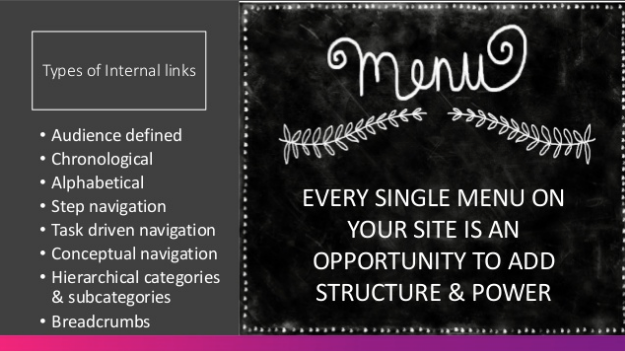 Here’s her recommended read: A Taxonomy of Web Search. We’re living in an age of ubiquitous computing as the average person has more computing power in their phone than we used to be able to provide from a whole room. Though an incredible amount of data is available to us, it also means we are weighed down by it. Think about Choice Theory, the notion that the more choice we have the less we buy, as we can only really cope with about 7 items at a time. Which is why we need to think about SEO like an iceberg. It’s not simply that people won’t just scroll beneath the fold because people think what’s below is more of the same. They won’t scroll because they have ‘iceberg syndrome’. If you have things like ‘view more’ you need to help them understand what that is, so they actually go for it. The combination of iceberg syndrome and reasonable surfer means Google will follow the links people are likely to click, using predictive JS. So, be careful how you code things – especially on mobile. Work with people’s low attention spans, use informational clusters and working memory chunking, or clustering related things together. It is important for your search UI to be agile and able to be redesigned over time with adaptive content and responsive user design. Even more so on mobile, where your UI can easily overwhelm the mobile-first user in what Dawn refers to as an ‘attention economy’ and remember to make your navigation as clear for bots and easy to use for humans as possible. Avoid long form content on things like eCommerce – but that said don’t just have pictures, be interactive be adaptive think Gestalt! 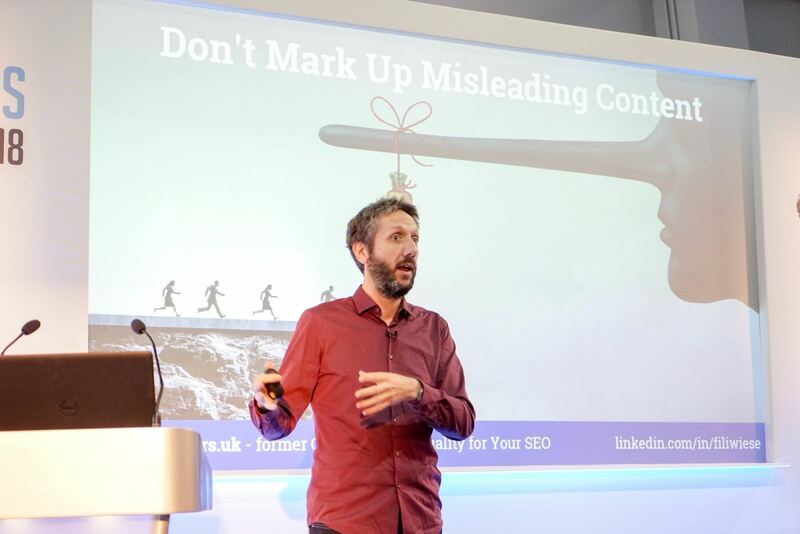 Luke Carthy is a Digital Manager at Mayflex, and unbelievably it was his first time speaking on the SEO circuit! He gave us juicy examples of how badly SEO has been done and why internal search SEO is essential. 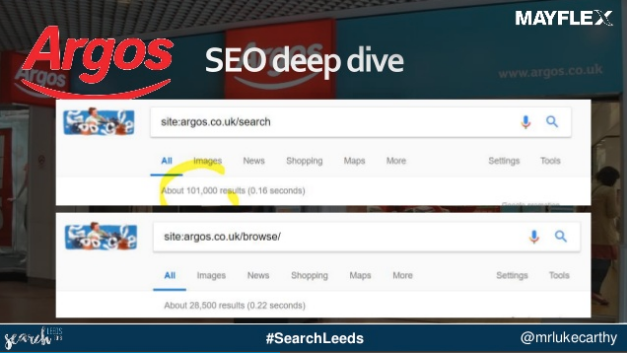 Luke gave us tips for comparing search categories, by using site colon to do a deep dive to find an indication of how many URLs are indexable in google search. As well as comparing search to browse and assessing your options, as seen below. 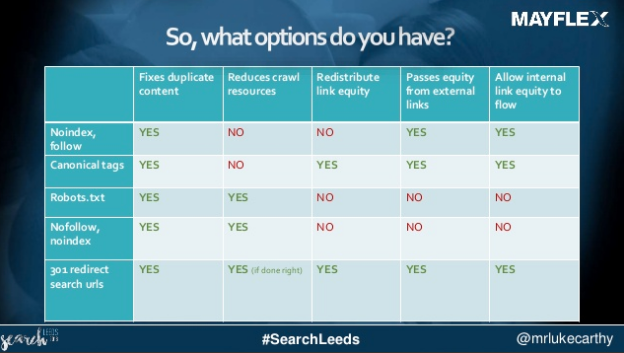 Luke walked us through how best to approach SEO issues like duplicate content, redistributing link equity and how to pass this from internal versus external links, as seen in the below. He also recommended using Ahrefs to see rankings/backlinks, and using DeepCrawl and Google Search Console for sizing up your search URL issues. We’d recommend using a combination of both, as you can manually upload backlinks from any provider into DeepCrawl, and/or avail of our free direct integrations with Majestic, Google Analytics, Google Search Console, Logzio, Splunk to get a really comprehensive view of your individual URLs and site structure as a whole! Luke pointed out that just because they’re not in the index, doesn’t mean Google hasn’t found out about them. That’s why there’s a discrepancy between how many links are in Google Search Console versus how many are getting indexed! Identify link juice to search URLs using a combination of Ahrefs and search console, and look at URLs that are 301-ing with worthy backlinks. Identify URLs with organic traffic generating sales with GSC to figure out which URLs are getting traffic; there’s a difference between URLs getting backlinks v getting links which could be the difference of what keywords are used! Rachel is the Technical SEO Executive at DeepCrawl, and frequently contributes to the SEO community with content like this Mobile First white paper. Bear in mind that just because something is in a sitemap doesn’t mean it’s going to be indexed! Test your websites signals to check inconsistencies, redirects and canonicals to broken pages or sitemaps or search impression distribution with Google Analytics and GSC to find non indexable pages getting impressions or pages you didn’t want to/plan to be indexed that found their way into the SERPs and people are landing on, looking for or being served because they’re useful – fix them make them indexable if they’re worth it! Julia from IrishWonder SEO Consulting walked us through where websites are vulnerable to hacking and security issues, as well as providing actionable tips on how to perform security audits to keep your site safe and secure. By the time you see a security warning in Google Search Console, it could be too late to save your website. This is why you need to be proactive when it comes to keeping your site secure. You need to incorporate basic security checks into your SEO audits to make sure you’re regularly up to date on your site’s status and safety. You need to monitor your website and any hacked content that may have been added. Take responsibility for your own vulnerability or security issues, as Google won’t be able to save you. Act quick, but don’t panic! Julia recommends using the following tools for security auditing: WPScan, Pentest-Tools, Drupal Security Scan, Sucuri, Qualys SSL Labs. Remember, some custom platforms need manual checks and don’t have tools that work for them. Kelvin Newman is the founder of Rough Agenda and the biggest search even in the UK, probably Europe, and hey maybe even THE WORLD: BrightonSEO. In this presentation Kelvin shared practical ways of coming up with keywords you can target as well as what not to do. We are moving away from the old model of is the search query on the page and does the page deserve to rank, and if you get those right everything is ok. And are now using the new model of does it contain the search query but also include the phrases that rank for that term and does it deserve to rank. Kelvin reminds us to not be lazy. Don’t just write for your users and assume that’ll cover your keywords! 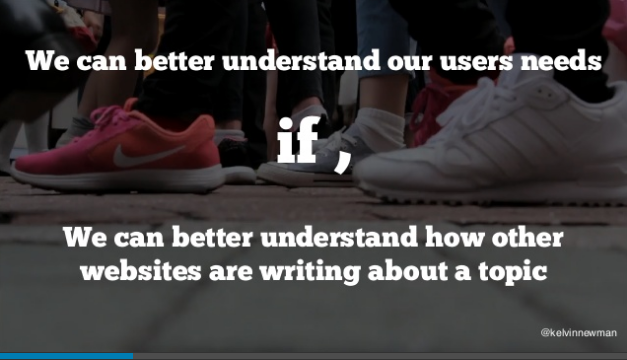 Instead understand what users and competitors are doing. Do more than add key phrases – have all the phrases and words they’d expect. Use Textise.net and look into the overlap of words or phrases competitors are using that you’re not, best with 3 competitors only (think of a venn diagram and how well that’d work out with more or less) so you can see where the competitors overlap and you don’t! 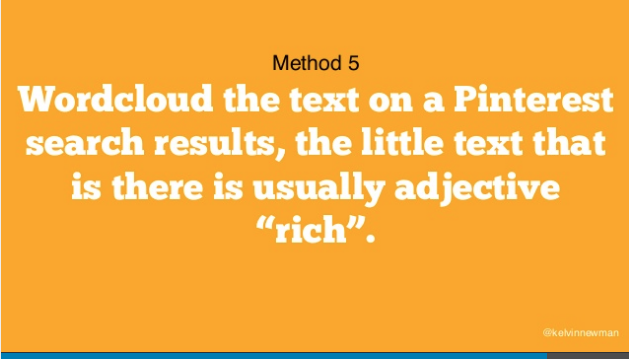 Try using a combination of word clouds and twitter feeds, and word clouds and Pinterest to get great adjectives. Use image search to see what also comes up. Things that won’t show up by using tools alone, like Answer the Public. 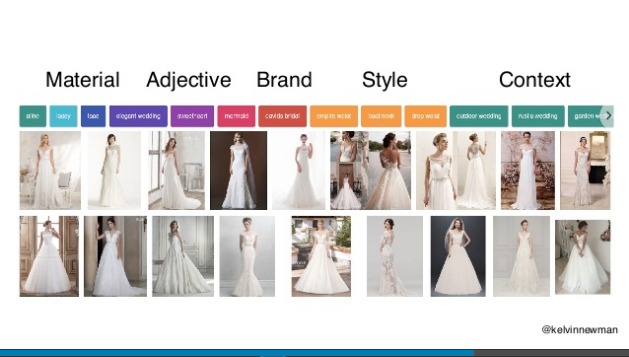 By going a few levels deep and even digging into the categorisation of search queries people are making, like colours or materials for clothing, you can find even more queries to optimise for. Stephen is the Director of Search at award-winning agency Branded3, and the founder of Search Leeds. His talk helps us reflect on helping your business thrive by putting your customers at the heart of it, and how optimising for them helps us win in search. AMP is this year’s Google+ as it’s the thing that Google wants but nobody else wants, so don’t mind that, just make websites faster! If you made it this far into this beast of a recap post, I salute you and I thank you. If you were there on the day I hope you had as much fun as we did, and were able to stop by the DeepCrawl bar. 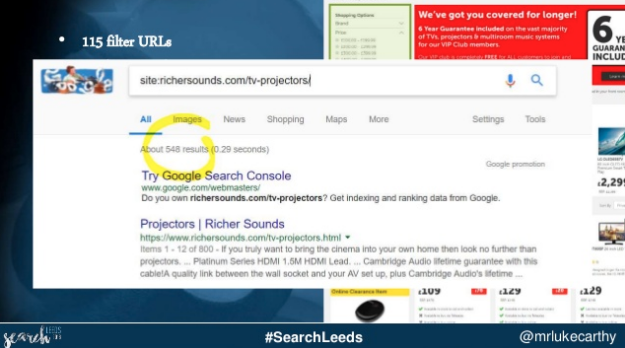 If you were not able to attend SearchLeeds, I hope you were able to take some value from this piece that you can apply in your SEO adventures, big and small.